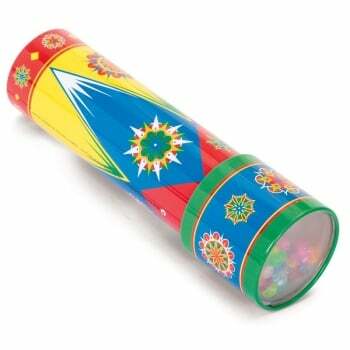 Classic optical illusion toy in a tin viewing scope. Look through the eye piece and twist the tin end section to create a wide variety of beautiful and unique patterns. The effect is made by a selection of colourful beads tumbling around inside a mirrored tube which creates of a perfectly symmetrical moving pattern to view. Assorted designs available.